In Florida, pests can get out of hand if not managed, Don’t let them takeover your home. Once in your home, it’s party-time for pests to stay and populate. Always Green quickly eliminates those pests currently visiting and prevents new pests from getting in. Our 16 Point Process relies on Integrated Pest Management principles. To learn more about our unique Pest Control, click on 16 Point Process in the menu. If corrective action is not taken, the pest situation will only become worse and suddenly these pest think they own your home or business. 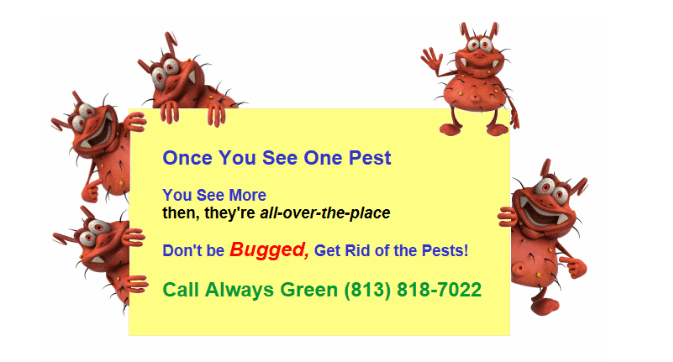 Take back your living-space, don’t delay call (813) 818-7022 for Always Green Pest Management that is focused on indoor pest control that works to remedy your pest situation and keep it pest-free. Always Green Pest Management is the indoor pest control company that does almost all the work outside of the building to keep bugs and pests from entering the home or office. You can count on us for experienced indoor pest control for the Tampa Bay Area. Always Green Pest Management has won the Angie’s List Super Service award 7 years in a row for Indoor Pest Control.